This might feel like a weird book to include, but I think it presents another side of strategy that is too often forgotten. It’s not always about bold actors and strategic thrusts. Sometimes strategy is about subtle influence. Sometimes it is framing and small tweaks that change behavior. We can have big aims, but get there with little moves. This book has excellent examples of that kind of thinking and how it is changing politics, government and business. My favorite example is about the bumblebee that they started putting on urinals–which drastically reduced the amount of spray and spillage because it changed where men aimed when they peed. It’s not exactly the coolest strategy but it solved a problem. So we can learn from it. A pioneer in behavioral economics and just recently awarded the Nobel Prize in Economics, his classic book on how to make better decisions. We use principles I learned in the book Nudge to inform our pricing strategy. Kapwing is free to use, but it costs $2/video or $10/month for unlimited videos to remove a small Kapwing watermark from their output video. In Nudge, Sunstein and Thaler describe loss aversion, or the tendency for people to value things more highly once they own them. Nudge is about choices—how we make them and how we're led to make better ones. Authors Richard H. Thaler and Cass R. Sunstein offer a new perspective on how to prevent the countless bad mistakes we make in our lives—including ill-advised personal investments, consumption of unhealthy foods, neglect of our natural resources, and other numerous bad decisions regarding health care, our families, and education. Citing decades of cutting-edge behavioral science research, they demonstrate that sensible "choice architecture" can successfully nudge people toward the best decision without restricting their freedom of choice. 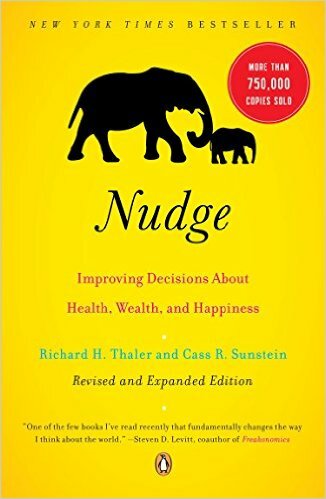 In the tradition of The Tipping Point and Freakonomics, Nudge is straightforward, informative, and entertaining—a must-read for anyone interested in our individual and collective well-being. Eric Ries - Quora Q&A - What are your top 10 business books?